Thank you so much to everyone that attended out 80’s Bingo event and made it as amazing as possible! We enjoyed an evening at the Ballard Elks Lodge with food provided by Phaya Thai Cuisine. Thank you so much for supporting Plus One Foundation! Take a look at some photos that capture our lovely event here. Thank you to everyone who joined us at our fantastic Bond Bingo event this year! We had a wonderful evening filled with good times and laughs at the Ballard Elks Lodge and incredible food from Pecado Bueno. This kind of night would not be possible without the support of our wonderful donors and sponsors. Thank you again to everyone who came out and made it such a special evening. We look forward to seeing you all next year! See our Facebook for more photos! Thank you to everyone who joined us at the Ballard Elks Lodge on the shores of Shilshole Bay for un magnífico viaje a La Habana to celebrate and support the grant recipients of Plus One! It was a spectacular evening of fast-paced bingo games, cocktails, dinner catered by Pecado Bueno and dessert by TNT Taqueria. We had hostess and professional auctioneer Sasha Summer Cousineau at Havana Nights Bingo. She did a wonderful job. Thank you for your support Sasha! Our event this year included: complimentary champagne when you arrive, traditional wooden bingo cards, standard bingo games, guest grant recipient speaker, bingo prizes valued $100+, raffle prizes valued up to $500 - raffle tickets only $5, maravilloso live auction items, themed photo booth, prize-winning costume contest, and fantastic views of Shilshole Bay! We had a wonderful night and hope to see everyone next year! Thank you to everyone who joined us for a night of Bingo with classy music, champagne and your favorite elegant party dress because “a little party never killed nobody.” – All while we made a difference and supported the grant recipients of Plus One. The party began with a cocktail hour followed by prize-winning Bingo, Live Auction, Dinner, Fancy Dessert and more Champagne. We had blast with our local Seattle celebrity and bingo calling diva Sylvia O’Stayformore as our Gatsby Bingo host. Check out last year's Gatsby Bingo Night 2015 photos on Facebook! Thank you to all the flappers and flyboys who joined us at the Ballard Elks Lodge on the shores of Shilshole Bay for a glittering night filled with fast-paced bingo games, cocktails, delicious hors d'oeuvres by City Catering Company. We kicked off the holiday season by giving thanks and celebrating Speakeasy style! We brought back the Juice Joint and celebrated the decadence, elegance, and joy of the 1920's. We were so excited to have local Seattle celebrity, consummate hostess, and bingo calling diva - Sylvia O'Stayformore host Speakeasy Bingo! 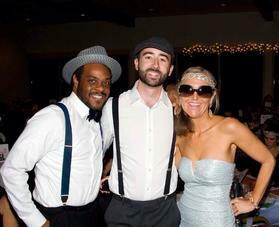 Check out more Speakeasy Bingo 2014 photos on Facebook! Check out our Bingo Games for the night! Check out our amazing Raffle Prizes! Check out the wonderful Auction Packages! Check out all the amazing prize donations from Seattle's premier restaurants, hotels and local businesses! An incredible evening filled with generosity and bringing hope to people with neurological disorders. With the support of local businesses, philanthropic guests, and an amazing team of volunteers we were able to raise over $25,000 to fund grants for 2014. This was our most successful fundraiser yet and we thank everyone who was involved for making it come true. Check out more Retro Bingo 2013 photos on Facebook!